Well, December really flew by. It was a busy month with traveling, holidays, family gatherings, and, of course, botany research! At the beginning of the month, I finished teaching a university course about the relationship between plants and people. It’s been really interesting to incorporate what I’ve been learning through my research into a class. I hope my students enjoyed it and I hope I’ll have the chance to teach it or another class like it sometime soon. Next month, I’ll be a teaching assistant for a different course about how to interpret ecological and botanical data. I’m looking forward to sharing my research skills with a new group of students! Writing bootcamp helped me think about the story that some of my data tell. 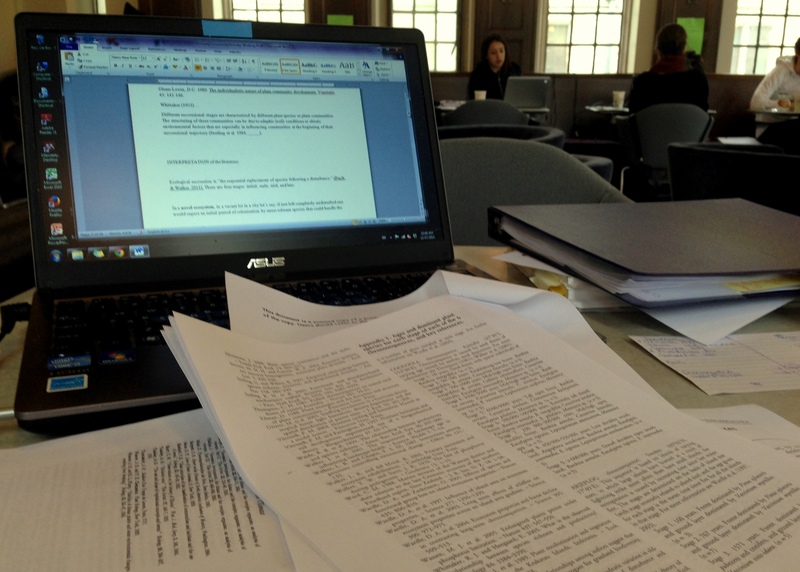 Writing about your research is a big part of the whole process. Earlier this past month, I also started to write a publication about my research. If you read my blog posts from 2013, you know I was collecting plant and insect data from green roofs in Germany. Now it’s time to take a close look at all the data and figure out what story they tell. To help me begin to write the story, I went to a writing “bootcamp” where other graduate students and I helped each other stay motivated to write about our research for 10 days. I was able to make a good start at writing but the bootcamp also helped me realize just how much MORE work I still need to do. 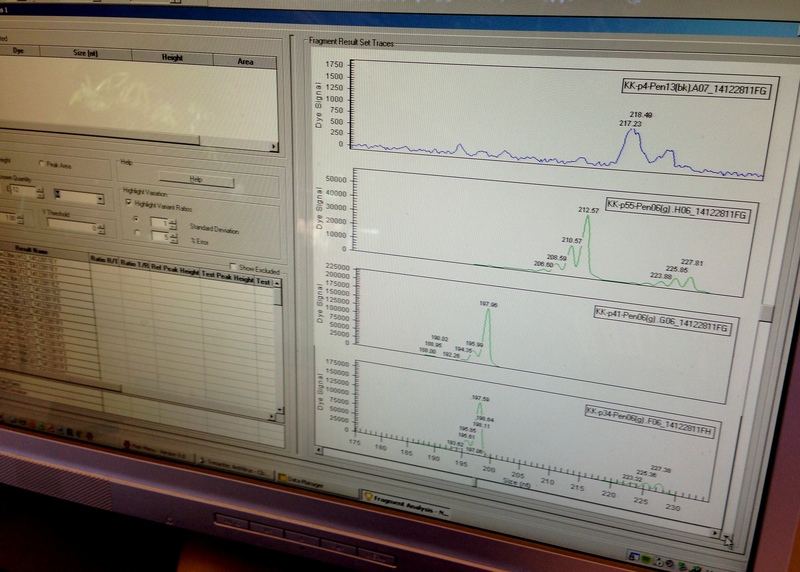 Collecting the data is just one part of the whole research process! 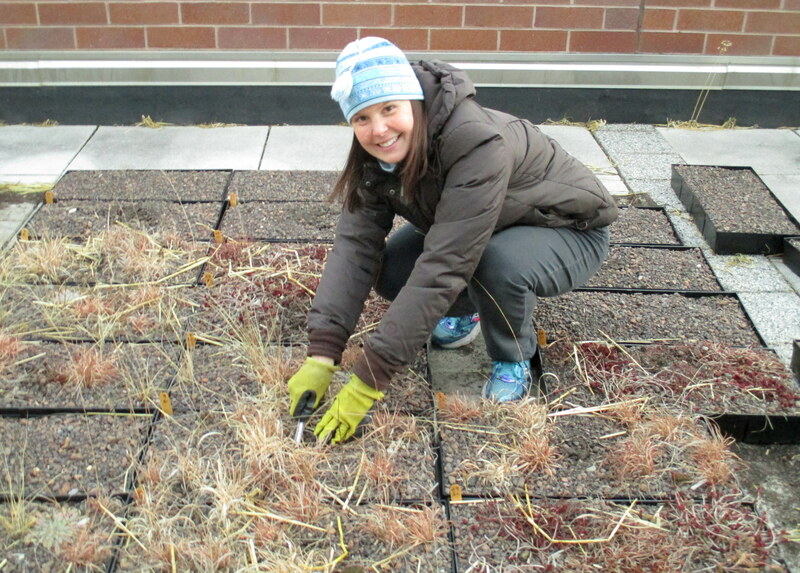 Collecting the temperature data in December – it was pretty chilly on the rooftops! 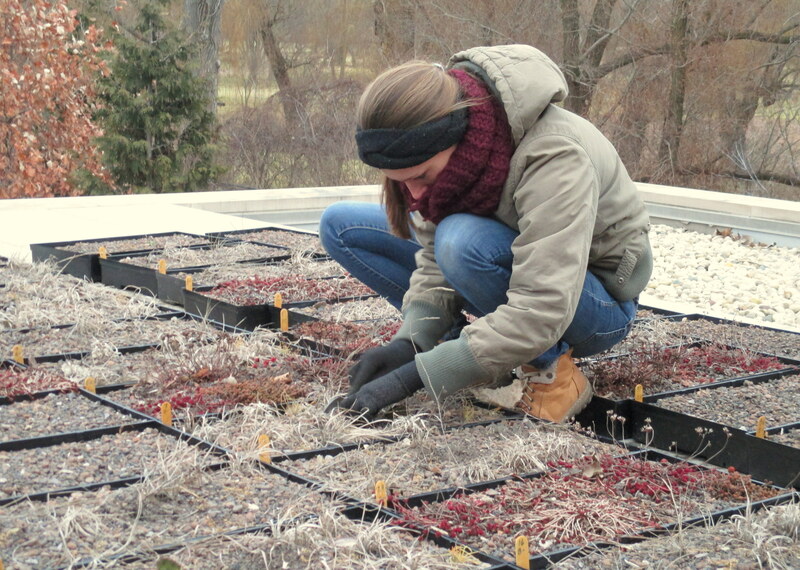 Undergraduate student Sussana helps to remove the temperature probes on a green roof. It was a cold month and luckily I did most of my work in a heated office or lab. But there were a couple days when an undergraduate student and I had to finish collecting temperature probe data from the green roofs. The soil in the roof trays was a little frozen, but (with the help of some strong metal spoons and a trusty hair-dryer) we were eventually able to remove all the probes, record the data, and rebury the probes, where they are now safely collecting data until the spring. Little agar plates are prepared and ready for me to put the cleaned seeds inside. The agar plates with seeds will stay in a cold incubator for the rest of winter. And I am happy to report that I finally finished weighing fruits, extracting the seeds, and cleaning and counting them all. Would you believe there were more than 40,000 seeds!?! I’m sure glad that the seed counting portion of my research is over for now! After I finished this part, I was able to move on to the next part of the experiment, which involved cleaning the seeds in a weak bleach solution to remove any contaminating fungi, rinsing the seeds, and putting them into small petri dishes filled with a liquid jello-like substance called agar. The agar holds water so when the seeds begin to grow, they will have a water source. 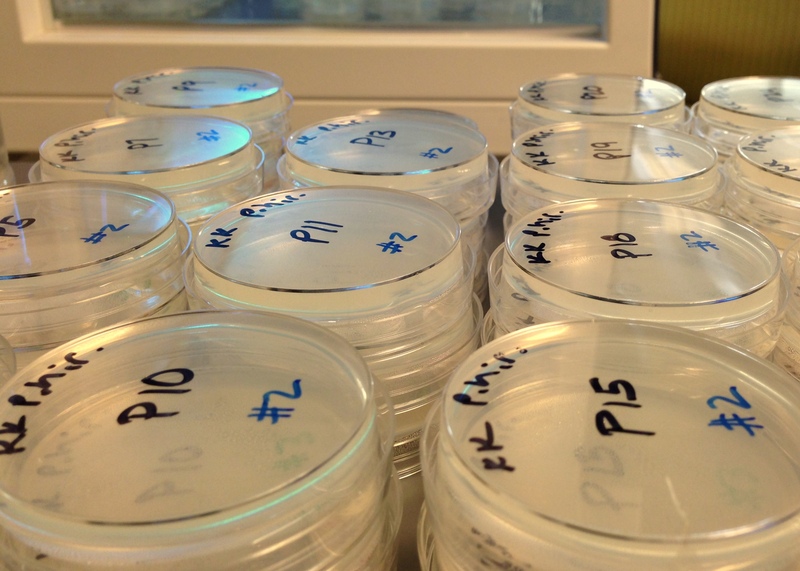 All the petri dishes are now in an incubator that is set at a very cold temperature to mimic winter in Chicago. In the spring, after the seeds have experienced a simulated winter in the incubator, I’ll remove them and help them grow into little seedlings so I can get DNA from their leaves for the next part of my experiment. I’m using a computer program to help me determine the DNA fingerprint of each plant that I used in my experiment this summer. In the meantime, I’ll keep doing the lab work I’ve started, where I am trying to get a DNA fingerprint for all the parent plants in one of my experiments. The DNA fingerprints will help me differentiate between all 50 plants that I had out on 10 green roofs this past summer. Over the next few months, I’ll keep using some fancy expensive tools to help me learn about the small differences in the plants’ DNA that makes each one unique, just like you and me.